After years of labor disputes, high operating costs, financial losses and crippling debt, Eastern Airlines ceased operations on January 18, 1991 and the assets were liquidated. 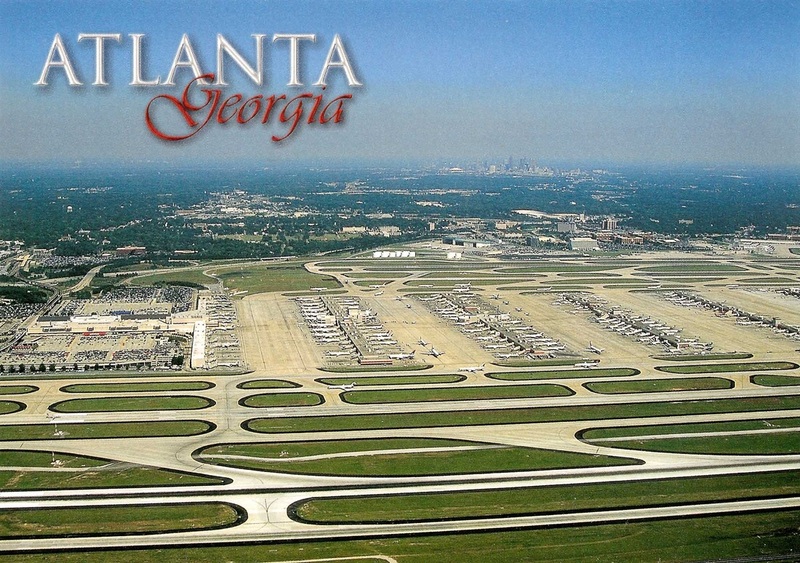 Once the largest airline in the free world, Eastern had been pivotal in the development of Atlanta as a major air hub and began air mail service to the city as Pitcairn Aviation in 1928. 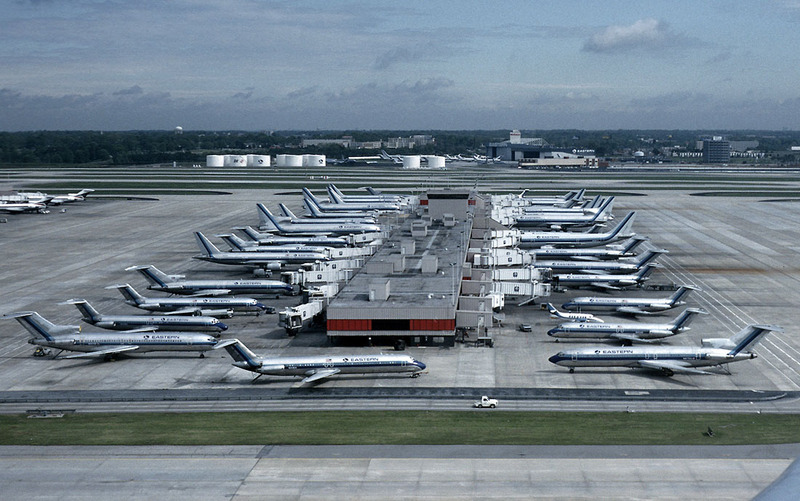 This photo was taken by Felix Goetting on April 15, 1991, nearly three months after the shut down and shows aircraft parked at concourse C and the Eastern hangar in the distance. Mr. Goetting wrote: "Altogether I counted 58 Eastern Air Lines jets and one Eastern Express Jetstream turboprop in this picture. The photo was taken from the US Air Fokker 100 N863US." Via planespotters.net. 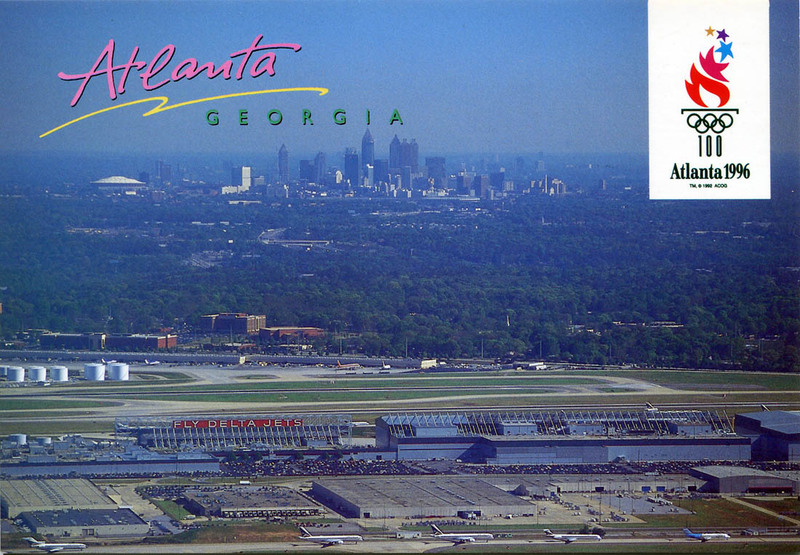 This postcard is from around 1991-1993 and shows concourse T, at center, still being used for international flights. At far left you can see the completed MARTA transit line that reached the airport in 1988. The large "EASTERN" titles can be seen on their former hangar. 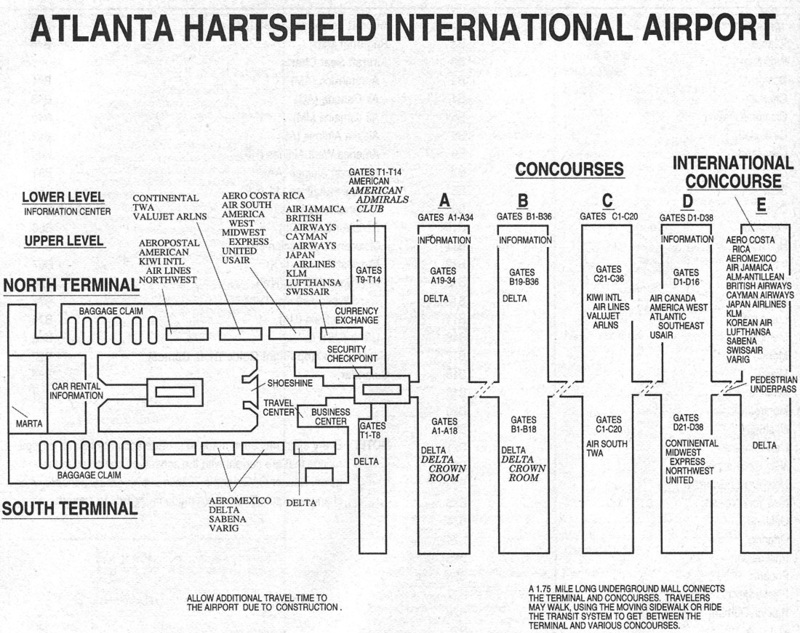 An Atlanta airport terminal map from April 1993 shows 10 carriers at the international concourse T and a dozen using concourse D. Delta had taken over former Eastern gates on concourse B while concourse C remained mostly empty. 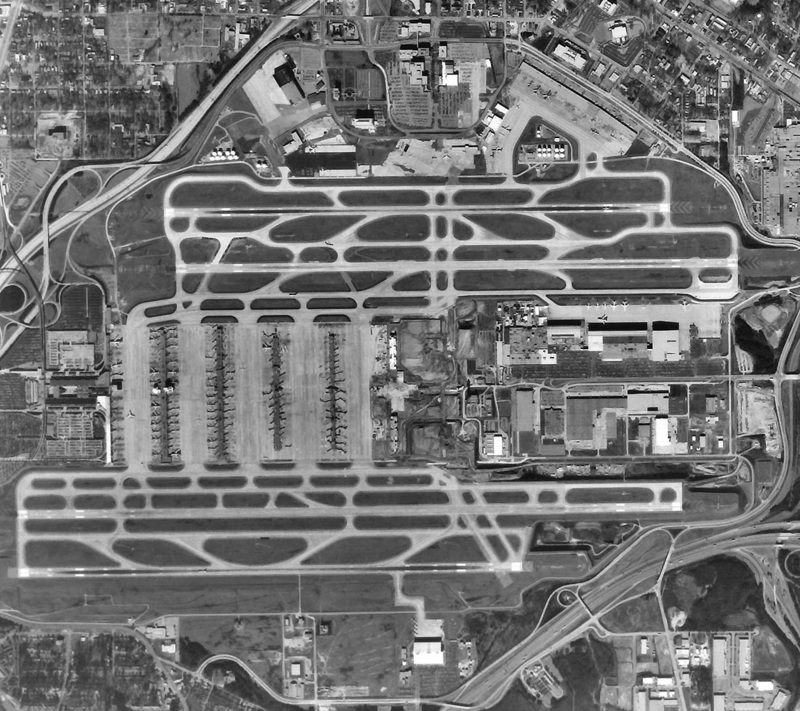 A 1993 aerial photo showing construction of the new international concourse E at center. A new addition can also be seen at the center of concourse A. It provided badly needed space for additional shops and restaurants. 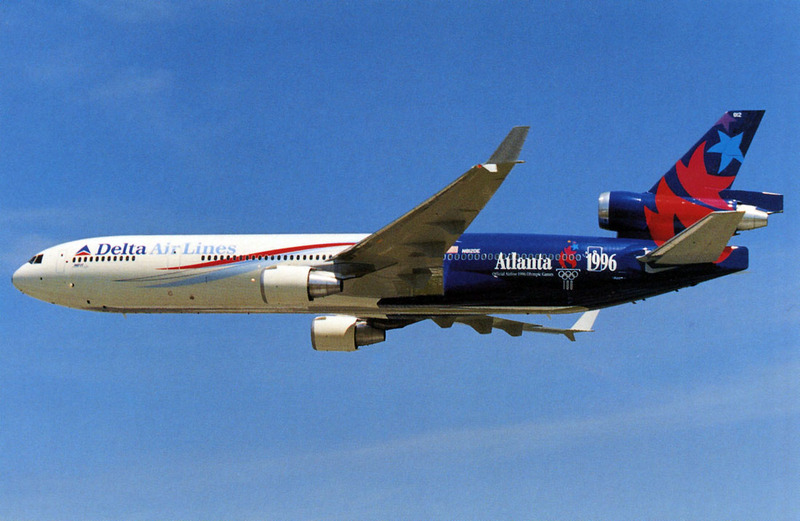 Following Eastern's demise, Atlanta was nearly monopolized by Delta Air Lines and was primed for the entry of a low-cost carrier. ValuJet began no-frills service between Atlanta and Florida in October 1993 using DC-9-32s formerly operated by Delta. By 1995 the airline served more than 20 destinations from Atlanta, had over 1,400 employees and was consistently profitable. Following a series of incidents and a high profile crash in the Everglades, the airline was grounded in 1996. 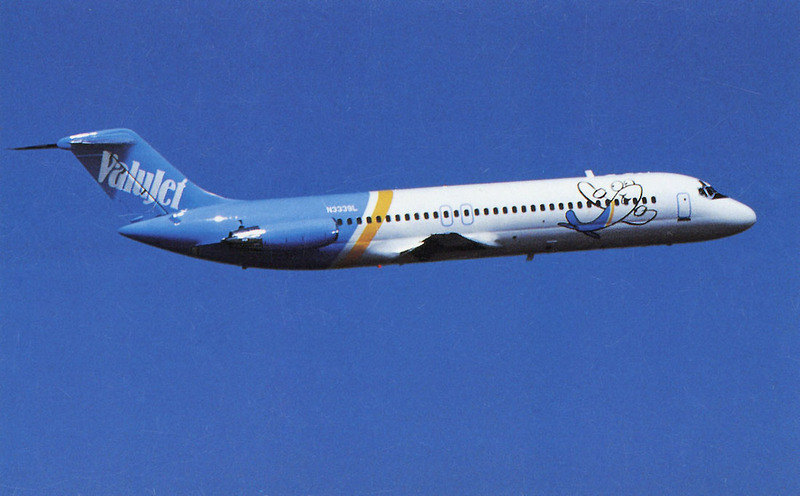 After resuming limited service, ValuJet purchased Air Tran in late 1997 and assumed the latter carrier's name. 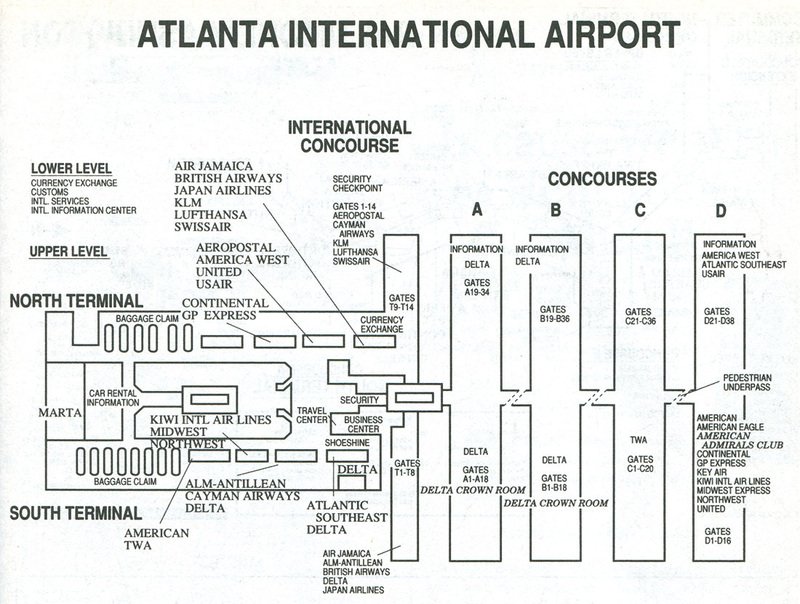 International flights were moved from concourse T to the new international concourse E in September 1994. Opened in time for the 1996 Atlanta Summer Olympic Games, Concourse E was considerably more spacious and aesthetically pleasing than the utilitarian design of the original 5 concourses. Upon opening, it was the largest single international facility in the country. This map is from December 1995. Delta was chosen as the Official Airline of the 1996 Olympic Games and painted the "Spirit of Delta" 767 N102DA in a special Olympic livery. MD-11 N812DE was the second aircraft painted in the Olympic colors. It is shown here on its delivery flight on April 8, 1996. 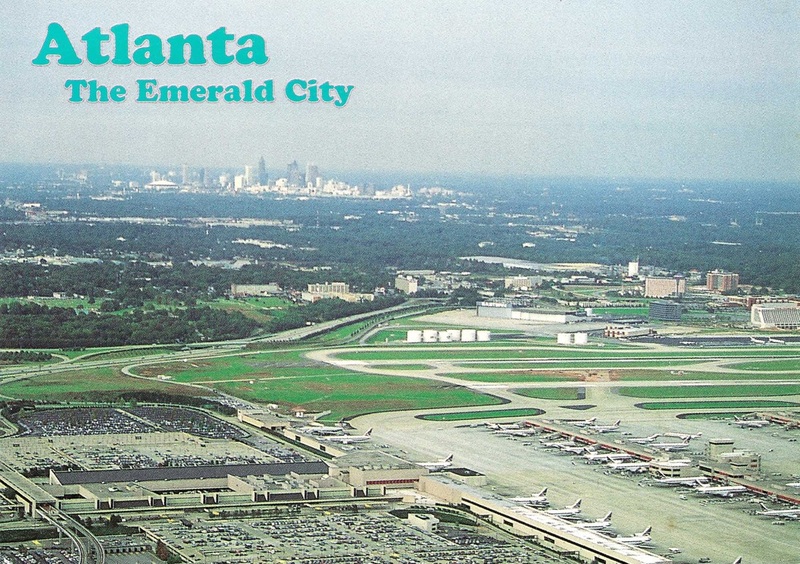 A 1996 postcard showing Delta's maintenance base in the foreground and the cargo facility just beyond that. Note the ValuJet DC-9 on the taxiway ahead of the Delta aircraft. This postcard is from the late 1990s and shows the main terminals to the left and concourses (from left to right) T, A, B, C, D, and a bit of the new concourse E off to the far right. 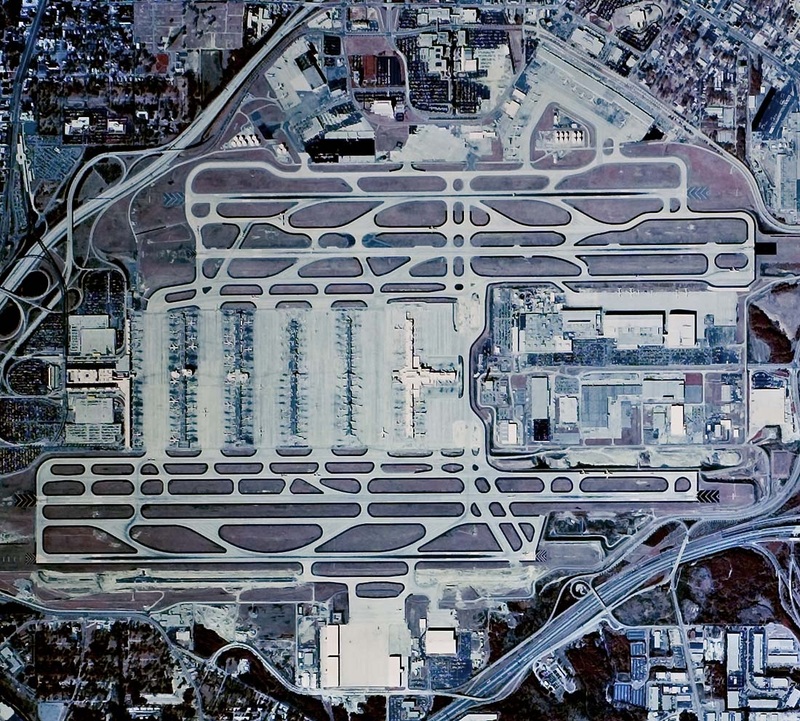 Delta took Eastern's former gates on concourse B and over a dozen planes of Air Tran (the successor of ValuJet) can be seen at former Eastern gates on concourse C.
This aerial photo from 1999 shows a new cargo complex on the south side of the airport and the construction of a new taxiway to accommodate aircraft using the facility. Also notable in this photo is an addition to the center of concourse B. 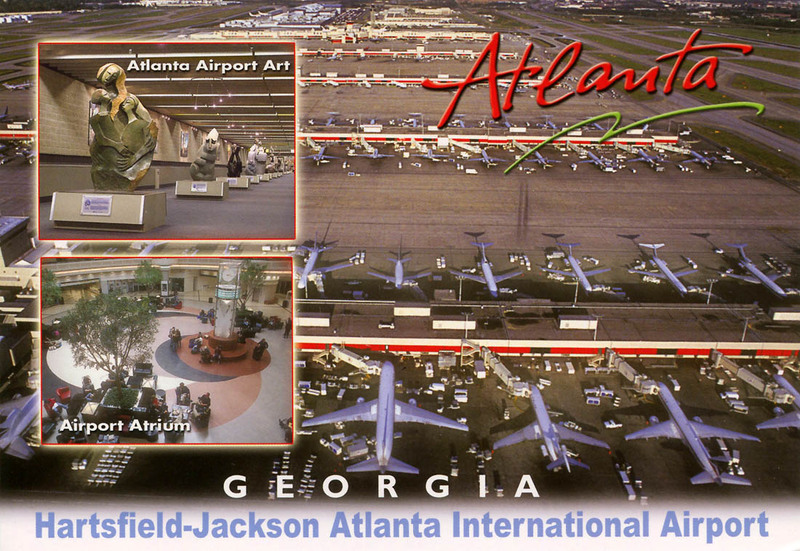 In honor of the late Atlanta Mayor Maynard Jackson, the airport was renamed Hartsfield-Jackson Atlanta International Airport in October 2003. 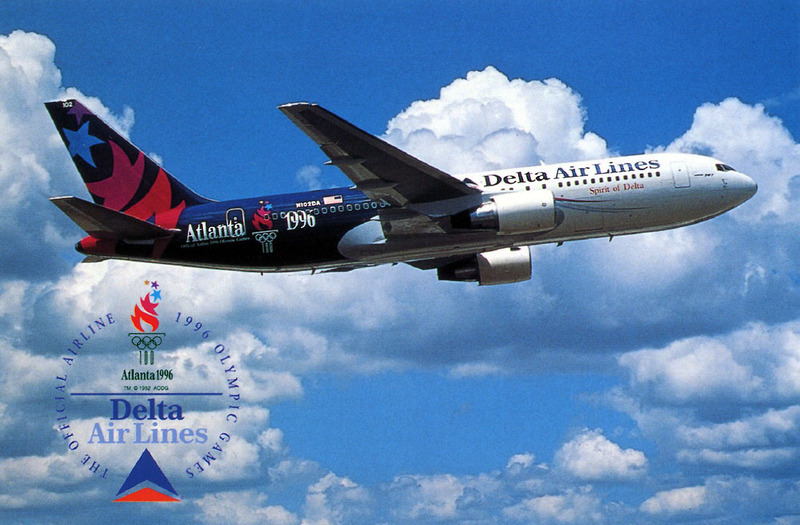 While this postcard was printed in the 2000s, the photo depicting Delta aircraft wearing the classic "widget" paint scheme appears to be from the mid-1990s. The airport underwent a $250 million renovation in preparation for the 1996 Olympics. The centerpiece was a new 3-story atrium located between the south and north terminals, a dramatic and successful attempt to provide an architectural focus for the airport and improve the cold institutional ambiance of ATL. Also seen on this card is the addition of modern art and additional lighting to enliven the bunker-like atmosphere of the underground transportation mall. This concludes our 9-decade tour of Atlanta Airport (at least for now). Please check back for regular updates and please contact me if you have anything you'd like to add here.